Smell that delicious pizza now! Buy this 15-inch baking Pizza Stone with Rack and Pizza Cutter. It's ideal for making your own special recipe in the kitchen, or for baking one from your freezer, or serving one delivered to your door. 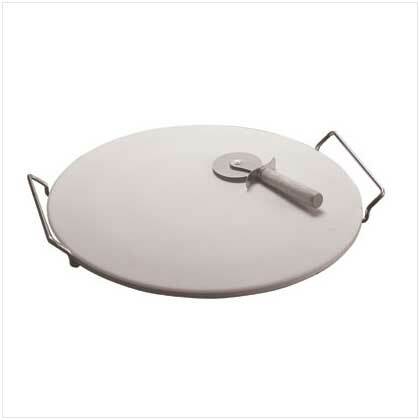 15 inch pizza stone is a good size to hold and serve pizzas up to 15 inches in diameter. Footed stainless steel rack Is durable, will not rust, and has two handles for ease in lifting and carrying the pizza. Pizza cutter Has an easy to grip handle and a sharp blade that will quickly cut through the pizza crust.